The generation of climate data records from satellite data that are robust enough to analyse climate variability and potentially climate trends, is a big challenge. Reliable retrieval algorithms, for the conversion of measured quantities into geophysical parameters, are an important prerequisite for all kind of satellite data-set generation. However, for the observation of variability and trends over a long time (decades), particular attention has to be given to fundamental technical aspects of the used sensors and satellites. Long time series are often generated from more than one sensor and more than one satellite. Even if the instrument design is identical, individual sensors can be different in behaviour and change with time. In addition, satellite orbits of older polar orbiting satellites were not stable, i.e. equatorial overpass times were drifting and observations were taken at different times of the day. This makes it difficult to distinguish between the trends in climate from the “trends” of the sensors and potential diurnal cycle aliasing. 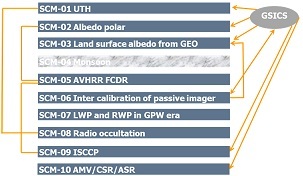 The processing of satellite data that allow quantitative assessment of climate relevant parameters (or Essential Climate Variables - ECVs), therefore has to include careful recalibration, inter-calibration as well as other correction methods. The resulting Fundamental Climate Data Records (FCDRs), e.g. homogeneous records of radiances or brightness temperatures, are the basis for further analysis and further retrievals (processing of Thematic Climate Data Records - TCDRs). The particular capability and responsibility of the operators of long-term satellite missions is obvious. The WMO Network for Sustained and Coordinated Processing of Environmental Satellite Data for Climate Monitoring (SCOPE-CM) aims to provide an international basis for the provision of high quality long-term data sets of what GCOS has defined as Essential Climate Variables using observations from space. Within SCOPE-CM, the contributing organisations coordinate their related activities and cooperate on the basis of shared and distributed responsibilities for the generation of global products. The SCOPE-CM Network was established (at that time as Regional/Specialized Satellite Centres for Climate Monitoring (R/SSC-CM), in November 2008 after several preparatory events, through the approval of the Implementation Plan. The initial participating organisations include the operators of operational satellites: CMA (China Meteorological Administration), EUMETSAT (European Organisation for Meteorological Satellites), JMA (Japan Meteorological Agency), and NOAA (National Oceanic and Atmospheric Administration, USA). To ensure proper liaison with other relevant initiatives and organisations, SCOPE-CM maintains formal links to CEOS, GCOS, GEO, CGMS, WCRP/GEWEX, WMO as well as to GSICS. The first phase of the project has been finalised and enabled the establishment of partnerships and coordinated activities within SCOPE-CM. The second phase of SCOPE-CM is ongoing with 10 new projects. Figure 1 below gives an overview of the various project and their interactions. Details on each project can be found on the SCOPE-CM webpage.